Definition at line 88 of file BinaryStreamArray.h. Definition at line 92 of file BinaryStreamArray.h. Definition at line 96 of file BinaryStreamArray.h. Definition at line 98 of file BinaryStreamArray.h. Definition at line 101 of file BinaryStreamArray.h. 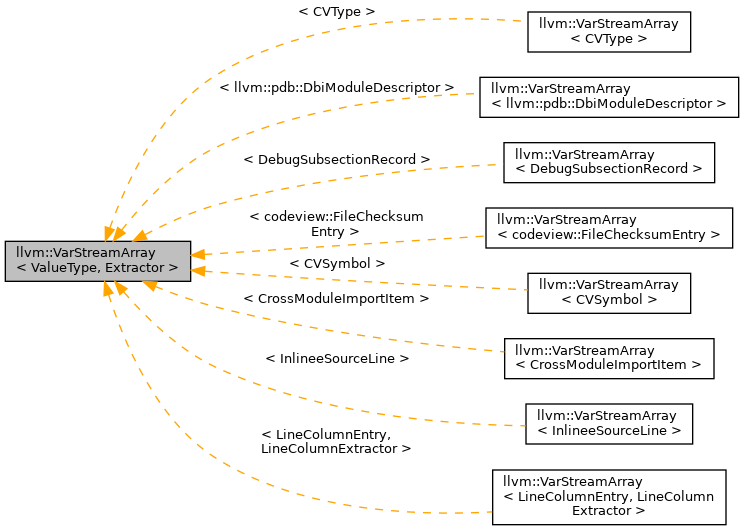 given an offset into the array's underlying stream, return an iterator to the record at that offset. This is considered unsafe since the behavior is undefined if Offset does not refer to the beginning of a valid record. Definition at line 128 of file BinaryStreamArray.h. Referenced by getFileName(), llvm::codeview::LazyRandomTypeCollection::getNext(), llvm::codeview::limitSymbolArrayToScope(), and llvm::pdb::SymbolStream::readRecord(). Definition at line 104 of file BinaryStreamArray.h. Referenced by llvm::codeview::DebugSymbolsSubsectionRef::begin(), llvm::codeview::LazyRandomTypeCollection::getNext(), llvm::pdb::SymbolStream::getSymbols(), and llvm::pdb::TpiStream::types(). Definition at line 141 of file BinaryStreamArray.h. Definition at line 113 of file BinaryStreamArray.h. Definition at line 111 of file BinaryStreamArray.h. Referenced by llvm::codeview::DebugSymbolsSubsectionRef::end(), getFileName(), llvm::pdb::SymbolStream::getSymbols(), and llvm::pdb::TpiStream::types(). Definition at line 132 of file BinaryStreamArray.h. Definition at line 133 of file BinaryStreamArray.h. Definition at line 135 of file BinaryStreamArray.h. Definition at line 136 of file BinaryStreamArray.h. Definition at line 110 of file BinaryStreamArray.h. Definition at line 115 of file BinaryStreamArray.h. Definition at line 108 of file BinaryStreamArray.h. Definition at line 89 of file BinaryStreamArray.h.